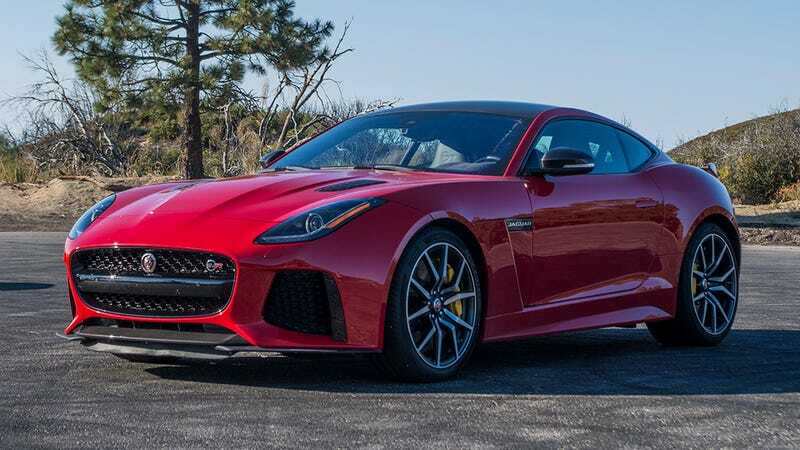 The 2017 Jaguar F-Type SVR has one of the best organic soundtracks of anything on the road blaring from its twin exhaust pipes. But every interesting car is a little more fun with music. Here’s a playlist I made to keep me company in this thing. If you expected a painstakingly curated collection of obscure music, I’m sorry to disappoint. My taste in tunes is pretty basic and rarely evolves. Although I am really digging the wave of groovy electro-sounding songs that seems to be creeping into pop culture right now. There is sort of a theme happening, here though. The F-SVR isn’t really a revolutionary new concept, it’s more like a modern take on a classic idea. Low-slung, long nose, loud V8... this would be Chapter One in “How To Make A Sports Car” if such a book existed. But it’s also built around an intelligent AWD system, which is basically a big high-tech safety net protecting you from the full idiocy a 575-horsepower car is liable to inspire. I tried to think about that as I picked these songs. “Oh Yeah” - Yello. I quickly realized it was impossible to look at the F-Type and not hear this in my head. So I listened to the first thirty seconds of it almost every time I turned the car on. “Terran One” - Glenn Stafford, Derek Duke, Jason Hayes. I’ve rediscovered the 1998 classic “Star Craft” since it was remastered over the summer and realized, hell yeah, the soundtrack is actually incredibly exciting. If you don’t know what the hell I’m talking about consider yourself lucky. “Stayin Alive” - Capital Cities. I hate the song that made this band famous but I am really into Stayin Alive remixes. “Devil” (Remix) - Electro Delux. Discovered this groovy group by accident, in a “You Might Also Enjoy” situation. This song’s fun but also kind of calming, and helped me keep from speeding. “Electrify” - Oliver, Scott Mellis. One of my gym friends introduced me to this and now it’s my go-to for an ominous-upbeat vibe. “Chocolate” - Big Boi, Troze. I’ve just been jamming out to this since it was in that episode of Ballers the other week. There are some other wicked beats on this Big Boi album, too. “Newsan” - Stephane Picq. In the early ’90s my grandfather had an MS-DOS computer with game called MegaRace preloaded on it. I spent hours in that poorly-animated world feeling like a futuristic driving hero. The songs still get me fired up to drive, oh my god, 25 years later? Well now I feel old. “Crockett’s Theme” (Redux) - Michael Cassette. I was too young to appreciate Miami Vice when it was new (don’t talk to me about that godawful movie reboot) but my dad was a huge fan and loved to pensively drive his convertible around listening to Crockett’s Theme. This dancy version is a lot more my speed. “Livin My Love” - Steve Aoki, LMFAO, NERVO. This is a filthy piece of trash music and I should probably be ashamed to admit it’s consistently my favorite fast-car-driving song. “Bonkers” - Dizzee Rascal. I just rewatched Kingsman to get fired up for the sequel and remembered how great Dizzee Rascal is. And British, to boot. Perfect for a Jag! What Is The Best Wrenching Music?